Aiming at maximum level of client-satisfaction, we are offering the Cardboard Feeder which is manufactured strictly as per the specifications of our clients. These machines are highly reliable for longer service life and gives and excellent performance. We tested these machines with the help of our diligent quality auditors in order to ensure their flawlessness and greater operational efficiency. 1. The cardboard size is adjusted by screw rod adjusting mechanism, one operator, simple quickly. 2. 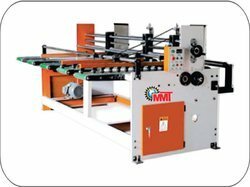 The convenience adjustable yards paper machine can better adapt to all kinds of cardboard and the paper-feeding is stable accurately. 3. The belt which convenes cardboard adopts the high quality rubber seamless belts, high friction, long life , less noise , easy maintenance and high economic benefits. 4. The double tension control is convenient and reliable. 5. The shaft adopts pattern roller,and it can increase the friction between paper belt and itself to ensure cardboard conveying is smoothly and quickly. 6. The machine has electromagnetic clutch and separation braking institutions. 7. 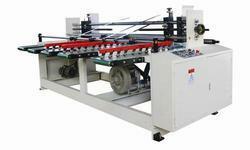 The electric machine adopts PLC automatic program control,and has a high degree of automation. 8. The inverter drives motor to realize speed stable running. 9. The photoelectric signal controls electromagnetic clutch brake by PLC, and realize synchronization with the host machine. 10. Electrical parts adopt international and domestic well-known brand to ensure that the machine operation is stable.